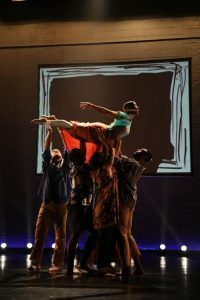 David Dorfman is a champion of the dance world and a veteran of the Bates Dance Festival, returning to the festival regularly for the past twenty-two years. 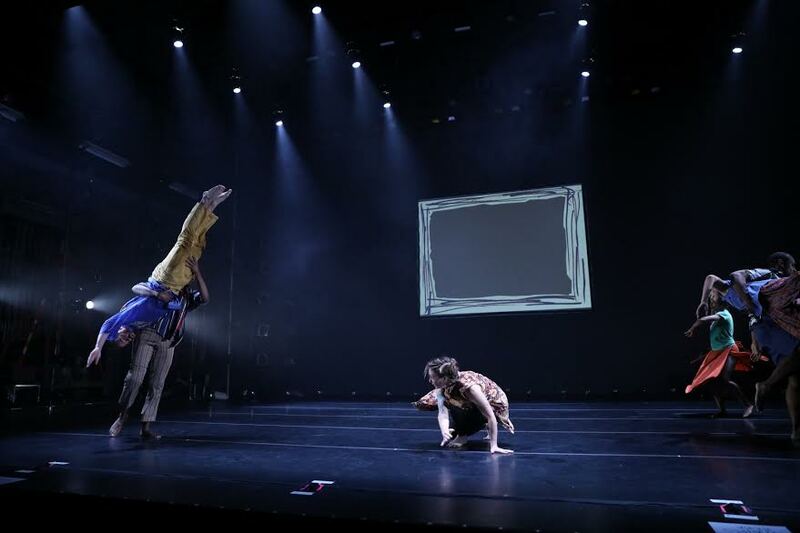 His company members are also familiar faces to the BDF community, having seen both sides of the Schaeffer Theatre, once sitting in the audience as students, interns, and counselors, and now, looking out on the view from the stage. 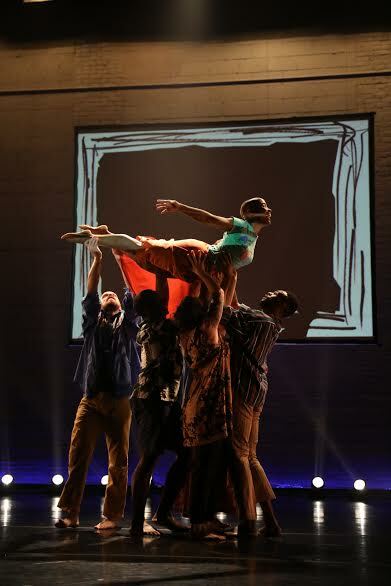 The festival has served as an incubator for many David Dorfman Dance works, and the essence of his new work, “Aroundtown,” epitomizes the foundational essence of this festival through a physical metaphor, emphasizing community, hope, and love. “Aroundtown” is alive, constantly shifting, collectively together. It leaves a pit in your stomach, a yearning for more, a desire to go there, to do that. Grandiose movement phrases and daring feats of physical stamina mirror the sweeping tone of the work, finding beauty and intimacy in the mundane, determining and defining a sublime way of existing in the world. The music, new compositions by Liz de Lise, Sam Crawford, Zeb Gould, and Jeff Hudgins, are performed live and add yet another layer of robustly evocative humanity to this rich world. The process, which has spanned over two years, has been a constant practice of sorting through and seeing. This work, which is responsive to the current moment, thrives on a constant questioning of what the most important residue is, both within the company and within the world. The result is sensical and familiar, but all at once nonsensical and abandoned, presenting an honest exactness that is subject to change at any given moment. Six dancers comprise the cast, the community. We see Kendra and Simon, Nik and Aya, Jordan and Jasmine. The work is contingent on them. We see these people, their whole being, not just their dancing body. Through the act of dancing they not only show themselves fully, they become themselves fully. The beauty comes with the togetherness of the dancers actively listening in the present moment, deeply sensing each other as humans above all else. Language is welcomed and necessary in this world, giving time and space to establish ideas and let them settle. Not just moving bodies, each dancer approaches the work from a deep place of truth, bringing with them their past and allowing it to mold their present. They support each other profoundly, sincerely, earnestly. Physical feats coupled with an unabashed outpouring of emotion create an emphatic world, wholly familiar and unfamiliar, sculpting a standard we, audience members and performers alike, relate to and strive for. The sense of community is palpable, a commonality in Dorfman’s work that is heavily amplified in “Aroundtown”. Impulsiveness stokes the dance, igniting performers and bringing them together, risking it all, physically and emotionally, individually as an entity. Touch is not just functional, it is an imprint left on each body, brought there physically and leaving a residue deeply infused with emotion. It is tender and it is human, it is all the things we cannot be alone. The work is constantly testing love and asking it to be real, not as a monumental or abstract idea, but as a glorious reality. “Aroundtown” functions as a real town, an enlivened community, the performers odd and model citizens. It is a thing everyone knows and recognizes; a folk dance we are all a part of and have different roles in. This work is an astonishing and beautiful feat of humanity. “Aroundtown” is an alchemy of movement and language, calling upon familiarities evident in society to craft a world beautifully specific and universally recognized, held preciously in the bodies and spirits of the movers and in the hearts of the audience. It is something they (and we) do not get to realize unless we are together, and that doesn’t always mean in unison. This post was written by Phoebe Ballard. Phoebe is the BDF social media intern for the 2017 summer. Special thanks to Kendra Portier and Simon Thomas-Train for their insightful words.